Haroon Khan, the younger brother of former world champion Amir, has decided to turn professional. "He's got a lot of talent and I know he can achieve a lot," said Amir. The 21-year-old Haroon, a bronze medallist at the 2010 Commonwealth Games, has been signed by Amir's new promotions company. "His amateur record will serve him well and I have no doubts his decision to turn professional will prove to be a very fruitful one," added Amir. Amir launched his company, Super Fight Promotions, with long-time promoter Dennis Hobson as a partner. "I've always wanted to turn professional and to do so under Super Fight Promotions was an opportunity that I couldn't turn down," said Haroon. "I have big ambitions but will take things a step at a time. I know I've got the best team behind me who have that experience to help guide my career to the very top." 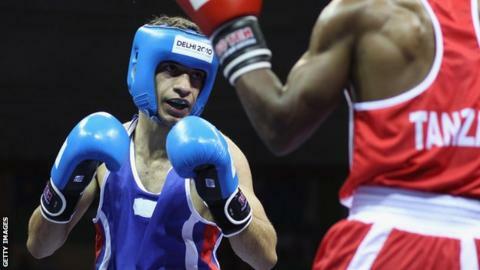 The younger Khan took flyweight bronze at the 2010 Games in Delhi while fighting for Pakistan. He was overlooked by England's selectors but beat Andrew Selby, who was picked ahead of him, en route to his medal.